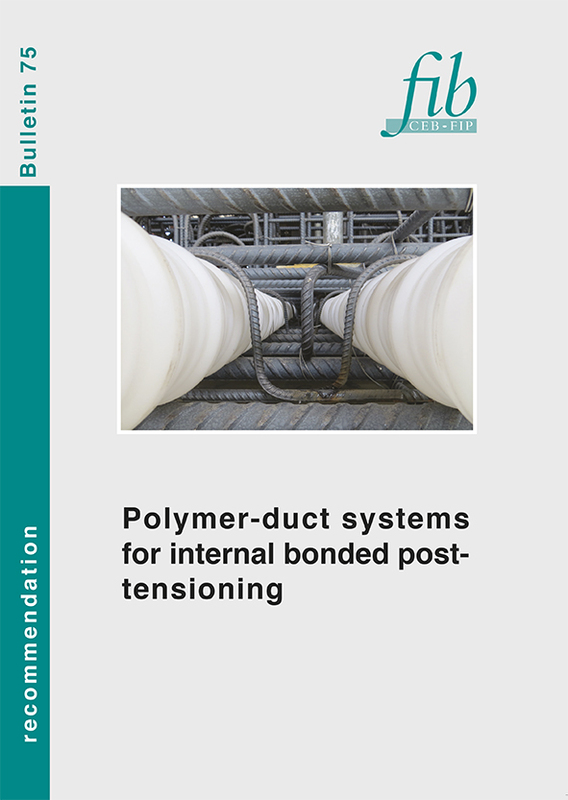 The purpose of this recommendation - fib Bulletin 75: Polymer-duct systems for internal bonded post-tensioning - is to update and amend fib Bulletin 7: Corrugated plastic ducts for internal bonded post-tensioning, a technical report published in 2000.
fib Bulletin 75 is meant as a cornerstone for the technical approval of polymer (plastic) ducts for internal bonded post-tensioning and possibly for the test procedures of a future testing standard. The updated bulletin includes new information on the design and detailing of concrete structures containing tendons with polymer ducts. The recommendation provides detailed test specifications for polymer materials, duct components and duct systems. In addition, the report contains recommendations for approval testing and attestations of conformity for polymer-duct systems. Although the new generation of corrugated polymer ducts for bonded post-tensioning have now been around for approximately twenty years, products still differ in material properties, geometrical detail, installation procedures and on-site use. Unlike corrugated steel ducts or smooth polyethylene (PE) pipes, they have not yet become standardized. It is the opinion of fib Task Group 9.16 and Commission 9 that these plastic ducts should, therefore, still be subjected to a systems approval process. This recommendation offers information acquired from twenty years of experience as well as new specifications that will, hopefully, lead to the standardization of polymer-duct systems.